As the last Ice Age was coming to an end, and as the first settlers arrived in North America, two distinct populations emerged. One of these groups would eventually go on to settle South America, but as new genetic evidence shows, these two ancestral groups—after being separated for thousands of years—had an unexpected reunion. The finding is changing our conceptions of how the southern continent was colonized and by whom. Scientists who study the settling of North and South America are rarely in agreement, and there are competing theories about who the first migrants were, how they arrived, and when. 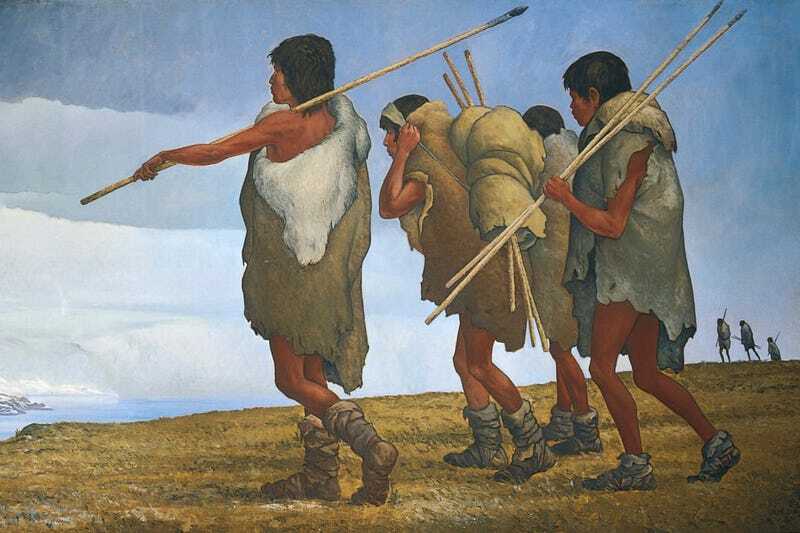 Research from 2015 suggests a single wave of settlers arrived to North America from Eurasia, after which time they diverged into two ancestral branches, a northern branch and a southern branch. It’s not entirely clear where or exactly when this happened, but genetic evidence suggests the divorce occurred between 18,000 to 15,000 years ago. That’s a few thousand years before an ice-free interior corridor appeared between the Cordilleran and Laurentide ice sheets, making North America accessible to settlers. So this ancestral split happened either in Beringia or among a group of settlers who made their way into North America after having traveled along a coastal route—an altogether distinct possibility, given new evidence published earlier this week. A research paper published today in Science suggests the latter scenario is the correct interpretation, and that the northern and southern ancestral groups reconverged and interbred thousands of years after splitting apart—an event the authors say could have only happened in North America, south of the receding ice sheets. What’s more, the authors of the new study say this intermingling of ancestral populations happened before humans ventured into South America, or as the southern continent was receiving its first human visitors. In total, the researchers presented four different possibilities, as illustrated in the diagram below. As noted, an ancestral split occurred among North America’s first migrants, and they remained separated from each other long enough for two distinct genetic lineages to emerge. A popular interpretation is that the northern branch spread eastward towards the Great Lakes region, possibly following the retreating glacial edges, and eventually giving rise to many Native communities living today in the the East. Meanwhile, the southern branch travelled southward along the Pacific coast, inhabiting islands along the way, and finally arriving in the southern continent where they gave rise to all Central and South American indigenous populations. The new research, led by Christiana Scheib from the University of Cambridge, suggests it wasn’t as clear cut as this. These two populations, the study shows, came together prior to, or during, the peopling of Central and South America. As a result, the majority—if not all—of South America’s indigenous populations still contain traces of northern branch DNA. This conclusion was reached after analyzing 91 ancient genomes of indigenous people who lived in California and Southwestern Ontario. The DNA analysis also shows that the Clovis people, named after their distinctive stone tools, were closely related to the southern branch. The intermingling, or admixture, of northern and southern branch DNA happened either in North America before the southern branch made it to South America, or it happened along the migration route into South America, at least a few thousand years after the initial ancestral split. Genetic evidence in the new study shows that present-day indigenous populations living in both Central and South America have retained between 42 to 71 percent of the northern branch genome, which is significant. Quite unexpectedly, the researchers found the highest proportion of northern branch DNA among indigenous populations living in southern Chile. This area is home to the Monte Verde archaeological site, which at 14,500 years old is one of the oldest known settlements in the Americas. Scheib and her colleagues say this new evidence is a heavy blow to the theory that the two ancestral branches split while they were still in Beringia, and that multiple waves of genetically distinct populations ventured into North America during this initial migration period. Instead, the researchers say a single wave of Ice Age humans migrated to the southern boundary of the Laurentide ice plate, and the genetic split happened afterwards, likely in the northwest corner of North America. Potter’s primary concern about the new paper is the assumption that the ancestral split occurred in North America south of the glacial ice and from a population that made its way into the continent along the coast—a claim he says is “entirely unwarranted.” He says the four speculative models presented by the researchers is missing “one obvious alternative,” namely a split of the ancestral populations in Beringia, with one group moving along the coast and one group moving along the interior route, and eventually reconverging in North America, as per the new genetic data. Potter also takes exception to the claim made by the authors that “ongoing gene flow” among eastern Siberian and Beringian populations would’ve precluded the emergence of genetically distinctive populations. Indeed, the idea that Beringia was a “land bridge” is a bit of a misnomer; it was a massive landmass unto itself, and no human at the time would have considered it a mere passageway. In a press release, the authors of the new study suggest the reconvergence happened about 13,000 years ago, but Potter doesn’t buy it, saying the timing is “effectively unknown” and that many different scenarios are possible with genetic data. “I look forward to continued collaboration between geneticists and archaeologists to fully form colonization models that benefit from both rich datasets,” he said. Remember what I said earlier about scientists in this field rarely coming to agreement? Given the complexity of American colonization, and the frustrating lack of both archaeological and genetic evidence, it’s hard to blame them. But as time passes, and as more data accumulates, hopefully a consensus will start to emerge.